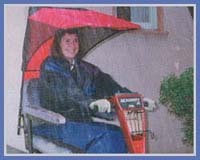 The Weather Canopy attaches to your electric wheelchair or scooter to protect you from sun and rain. It's great for getting to and from work, daily errands, waiting at the bus stop...whenever you need it! 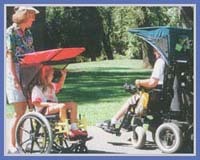 This canopy fits most any wheelchair or scooter. The canopy itself is one-size-fits-all, but the mounting kit will vary slightly depending on the make or model of your wheelchair or scooter. When you order, you will be asked the make and model of your wheelchair or scooter. When you receive your canopy, it will include all of the parts that you need to mount it to your scooter or wheelchair. How does it attach to my wheelchair/scooter? It will take you approximately 15-20 minuets to attach the two mounting poles to your wheelchair or scooter. These are black poles approximately 8" tall and less than an inch in width so they will not interfere with the normal operation of your wheelchair / scooter. Once the mounting poles are attached the canopy slips in and out. What are the different choices of canopy models? The base model is made of solid fabric and is less expensive. The vented model is similar, however, it has mesh material on the sides and back instead of solid fabric. The vented model is more popular because it provides more ventilation for heat protection while still sufficiently protecting from sunlight and rain. The Max Protection model is the same as the vented model, however you also receive plastic drapes that cover the sides from canopy top to seat bottom to give you maximum protection. The plastic drapes slip over your canopy and are easily removable. *Note-by choosing your make and model you will be assured that you will receive the proper mounting kit. Is the Canopy easy to use and store? Yes! The frame easily disassembles into 5 interlocking pieces in 30 seconds and stores easily into the carrying sack that is included with he canopy. To place your order, click HERE or call 1-800-449-8991 with any questions.